I was pleased to see that this months Food for Thought Cooking Club Challenge was Pumpkin Soup by Jamie Oliver. Strangely, the “pumpkin” soup is made with butternut squash, which was fine as I really like oven roasted butternut squash. What really interested me about the recipe was that it included chestnuts. I have been seeing chestnuts at the farmers market and I have been wanting to try using them in a recipe. The recipe did not really say what to do with the chestnuts so I roasted them in the oven and peeled and chopped them. The butternut squash soup was really good! It was nice and thick. The chillies added a nice heat and that balanced well with the sweetness of the squash. The soft chunks of chestnut added a nice texture. 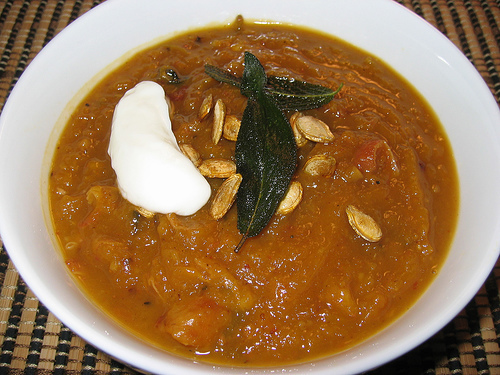 How can you go wrong topping the soup with sour cream and crispy fried sage and squash seeds? Even though I halved the recipe I have a lot leftovers. I will be able to enjoy this soup for through out the week. Nice soup Kevin. I think I too will participate in the Food Network’s recipe cook-off. This looks like a very good recipe. I had made butternut squash soup, and then had some at my in-laws that was completely different. And this one looks different than the other two I have tried! It’s amazing how a simple idea can be done so many different ways. Kevin, nice presentation! I love butternut squash,you can do so much with it. I can feel the warmth of this soup in the cool weather now. Lisa: That is one problem with having external links. 🙂 I found the recipe on the Food Network and fixed the link.